Approaching hydrodemolition from a new perspective, Aquajet Systems has paved the way for the wider use of the technology through the launch of its new Ergo system. This provides simplicity, low weight and high capacity for brand new user groups. The new Ergo was launched at Aquajet Systems latest annual ‘Hydrodemolition Days’ where suppliers and customers from all over the world are invited to product reviews and demonstrations. This event has developed an international reputation, with PDI magazine having been invited, and attended, on several occasions. This year’s event proved to be as enlightening as ever. The 2018 ‘Hydrodemolition Days’ was held from the 11-13 April and saw more than 150 people gather at Aquajet’s headquarters and factory in Holsbybrunn outside Vetlanda, Sweden. The attendees consisted mostly of customers but also suppliers, and came from all corners of the world. This has proved to be a particularly attractive facet of the event, with a need to focus on the method in many different contexts, regardless of country of operation. On the first day of the event, visitors gathered in one of the manufacturing halls in front of a temporary building site. Aquajet Systems chief executive Roger Simonsson welcomed everyone, stating that Aquajet Systems was celebrating its 30th anniversary, as the company had been founded in 1988. Roger was followed by Brokk's chief executive Martin Krupicka (Aquajet Systems was acquired by Brokk in 2017), with Krupicka outlining Brokk's history, technology and products. He also discussed how Brokk and Aquajet Systems will together face the future, merging two distinct product lines and methodologies. Following these presentations, Aquajet Systems design and engineering director Ronnie Hilmersson presented to the audience Aquajet's new Super Lance System 3000, a new lance system with capacity up to 3000 bar. This features a reduction of the lance diameter from 45mm to 36mm as well as improvements to the nozzle. The system is easy to mount, and equipped with standard couplings providing a more flexible system. Ergo Controller is also the power source for running the other new products in the Ergo family. Every details is said to be highly innovative to the smallest detail, including the new control box, and a number of new hydraulic quick-connect solutions, as well as start kit called Ergo- Go. The Controller also acts as the power source for two important tools that take concrete repairs and industrial clean-up to new levels. The next product launched was the Ergo Climber which is a frame system that can be quickly built up using standard scaffolding pipes. It is packed with effective water nozzles that remove damaged concrete in very difficult and confined areas. The complete system measures 1.5m x1.5m and has a total weight of 85kg. The system is said to be so easy to manage that all parts can be carried by a single person. This was followed by the Ergo Spine which is a rail system for different types of convex or concave surfaces, such as concrete pillars. Ergo Spine, like Ergo Climber, is of a very light weight construction, with the new aluminium rails reducing the weight significantly, with the 2m rail sections weighing only 20kg. Ergo Spine's flexibility significantly increases accessibility at work, and can also be adapted for use with a Brokk robot. In addition, the system can be extended and expanded to meet user requirements. Each section between the supports measures 2m and, for example, a complete 2m x 2m Ergo Spine system weighs a total of only 125 kg. "Our new Ergo family will take the hydrodemolition technology and also industrial cleaning work several steps further. The new technology is considerably more accessible and efficient to work with. Ergo also opens up (usage) for other businesses than specialised hydrodemolition contractors to start working with this technology. An exciting future lies ahead of us,” commented Roger Simonsson. 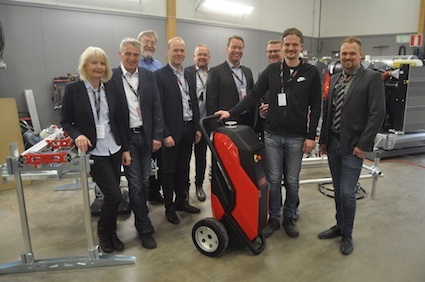 The Hydrodemolition Day continued with visitors having the opportunity to look a little closer at the new products before Aquajet Systems founder, Stefan Hilmersson, took the participants on an interesting and fun journey’ through time’. This began with the company being founded as a hydrodemolition contractor, until the situation today with Aquajet being the world’s largest manufacturer of hydrodemolition equipment. The first day of the event continued with live demonstrations of the other new products and ended with a dinner. The second day was devoted to various product and business meetings as well as separate meetings for Aquajet’s worldwide distributor network.